*This post contains affiliate links and/or sponsored products. Please read my Disclaimer page for more information. Hey, Guys! 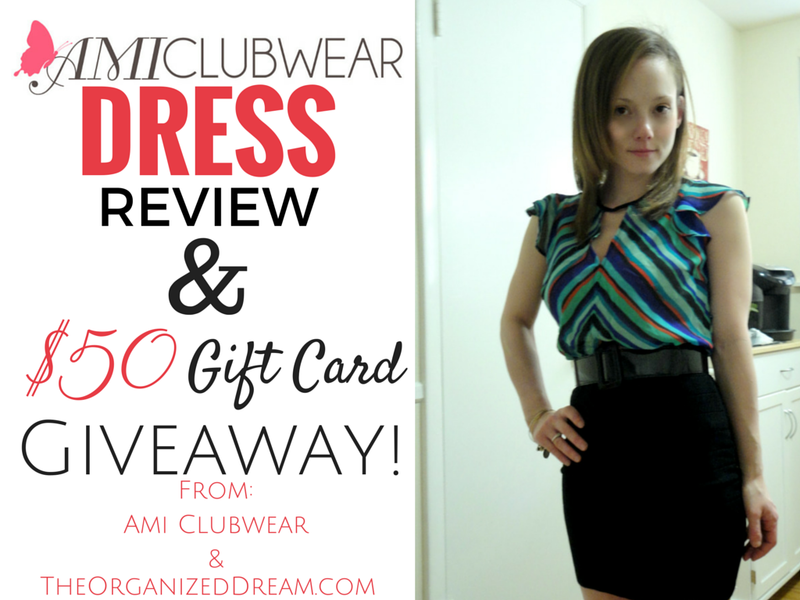 I'm really excited to share with you this giveaway from AMI Clubwear! I've visited their website in the past many times and love their products. (Especially their shoes!) They contacted me and offered this giveaway to one lucky winner and I couldn't say no! I also have a great dress review from their prom/evening collection today! AMI Clubwear gave me the option to select five different dresses and they sent me one of them. This is the one I received. I paired it with these heels. I like the variety of colors in the top of the dress and how light it is. The only thing I didn't like about it at first when I opened the package was how sheer the top seemed to be. Once I tried it on, I couldn't see through it as much as I thought I would. Actually, I really couldn't see anything, but if you're not okay with sheer material, there's nothing a little cami underneath can''t fix! At first, I thought it wouldn't fit. I'm a very small 4'11" and can't even fit into adult jeans. (A little secret...I wear a size 10 in girls...no joke!) Surprisingly, this dress fit great! I like the structure of the bottom half of the dress. I like how it doesn't fit too snug either. Because I'm so short, the hem wasn't too short. Even if you're taller than I am (which I'm sure you are! ), it would still be a good length because of the stretch in the skirt. I think I may add a belt to it. What do you think, belt or no belt? This dress would be perfect for a night out with friends, a special date with your love or even for Easter Sunday! I'll be wearing it this weekend for sure! I will announce the winner of the contest right here on the blog! You can see more dresses on this page! They have a great selection of maxi dresses (or mermaid dresses) on this page! Don't forget to check out the rest of AMIClubwear.com including shoes, swimsuits, accessories and more! Enter the Rafflecopter below for your chance to win a $50 e-gift card from AMI Clubwear! This contest is open to US residents only and void where prohibited. This contest will run until April 15th! That dress is super cute! I can't wait for the weather to warm up so I can start wearing dresses and skirts again. Thanks for linking up with Idea Box! I know! I can't wait either! I had to take these pictures inside because it was so cold out. Thanks for stopping by! My style involves a lot of color so I'll be getting a ton of different clothing items! I love, love, love Ami ClubWear. You are the first blogger I meet that likes to shop at their store too. Their clothes and shoes are super cute and affordable. Their SALE section is even better. You can find some amazing deals. Love your dress Kate! It looks beautiful on you. I've been visiting their site for years! Glad to know you like them too! They're a great place to shop! I dress casual and simple. I need to branch out and be more trendy. If I win I will get some new sandals for summer. They always have so many to chose from! Good luck! I really love all of the pumps! I like flowy dresses! I'd get Pink Orange Plaid Spaghetti Strap Maxi Dress.